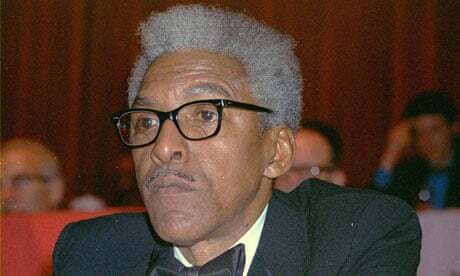 Overview: Born in 1912, Bayard Rustin was a Civil Rights organizer and activist. During his life, he studied at several colleges and universities, organized human rights protests, and advised Martin Luther King Jr.
Action: Learn about why Bayard Rustin was an important out gay African American man. Questions to Ask: What do you know about the Civil Rights Movement? 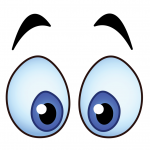 Who are some of the leaders? a) Tell a story: Bayard Rustin was born in 1912 in Pennsylvania and in his 30s, moved to New York. Rustin’s philosophy developed into a combination of Quaker pacifism, Gandhian nonviolence, and socialism. He also lived openly gay. In his lifetime, he was arrested and jailed for refusing to register for the war draft, protesting transit segregation, and for homosexual activity.In the 1950s Rustin began organizing with King and taught him about Gandhi’s nonviolence. With King, he organized the 1956 Montgomery bus boycott and the 1963 March on Washington. In fact, he was the main organizer behind the march, though he was kept in the background for fear that him being gay would be a liability. Despite this, Rustin continued to organize the march and the march was immensely successful. Rustin himself was hoping for 100,000 or even 200,000 people to show up. The actual amount of people who showed was 250,000.Rustin also worked with A. Philip Randolph, who he developed his socialist beliefs from. In 1965, they founded a labor organization for unionized African Americans called the A. Philip Randolph Institute.Despite his contributions, Rustin often was not given credit because he was gay. Likely, this was both because of homophobia and fear that having a gay organizer would hurt the movement. Reflection Questions: What are some of the important events organized by Bayard Rustin? What are some of the things Bayard Rustin did that furthered the rights of LGBT people? What are some ways that you are like Bayard Rustin? Bayard Rustin was born in 1912 in Pennsylvania and in his 30s, moved to New York. Rustin’s philosophy developed into a combination of Quaker pacifism, Gandhian nonviolence, and socialism. He also lived openly gay. In his lifetime, he was arrested and jailed for refusing to register for the war draft, protesting transit segregation, and for homosexual activity. In the 1950s Rustin began organizing with King and taught him about Gandhi’s nonviolence. With King, he organized the 1956 Montgomery bus boycott and the 1963 March on Washington. In fact, he was the main organizer behind the march, though he was kept in the background for fear that him being gay would be a liability. The NAACP’s Roy Wilikin even directly expressed, “I don’t want you leading that march on Washington, because you know I don’t give a damn about what they say, but publicly I don’t want to have to defend the draft dodging…I know you’re a Quaker, but that’s not what I’ll have to defend. I’ll have to defend draft dodging. I’ll have to defend promiscuity. The question is never going to be homosexuality, it’s going to be promiscuity and I can’t defend that. And the fact is that you were a member of the Young Communist League. And I don’t care what you say, I can’t defend that.” Despite this, Rustin continued to organize the march and the march was immensely successful. Rustin himself was hoping for 100,000 or even 200,000 people to show up. The actual amount of people who showed was 250,000. Rustin also worked with A. Philip Randolph, who he developed his socialist beliefs from. In 1965, they founded a labor organization for unionized African Americans called the A. Philip Randolph Institute. Despite his contributions, Rustin often was not given credit because he was gay. Likely, this was both because of homophobia and fear that having a gay organizer would hurt the movement. Video: Bayard Rustin and the March on Washington (2 minutes) Bayard Rustin MLK Organizer.